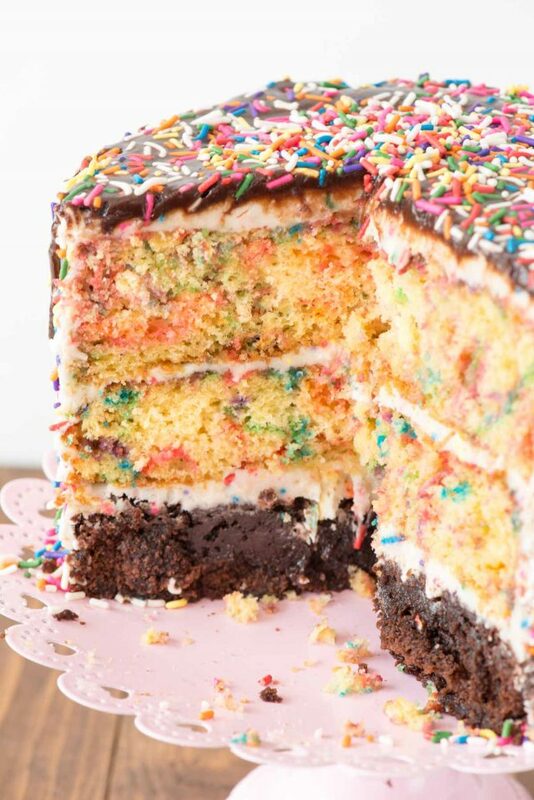 Funfetti Brownie Layer Cake – this cake is easier than it looks! There’s a layer of brownie and two layers of confetti cake, filled with a cream cheese frosting and topped with a hot fudge chocolate drizzle! It’s the PERFECT birthday cake recipe. Today is my 40th birthday!! It’s finally here, I feel like I’ve been waiting for it to arrive forever. It’s a special day for a few reasons. First, it’s not just my birthday: it’s Crazy for Crust’s birthday too! Crazy for Crust turned 7 years old yesterday and that has everything to do with why I’m so mushy today. You see, not only is today my big day, but this weekend is an entire event. Mel and Jordan are throwing a huge birthday bash for me this weekend and all my amazing friends are coming – even the ones from out of town. You see, when I first started this blog I was in a weird place. Jordan was going to Kindergarten and I was in that weird in-between time between mom’s club and school. I had acquaintances who were parents of Jordan’s friends but I didn’t have people. I was craving friendship; real connection with other women who didn’t necessarily want to hang out with me just because they wanted to get away from their kids too. I wanted something for me that was separate from my life as a mom. One random day I decided to start a blog. I designed a horrible logo, set up a free blogger blog, and hit publish on my first recipe. Over the years I met other bloggers and started to form friendships with them. I got invited on brand trips or went to conferences and met these other bloggers in person. Slowly but surely, I met a squad of ladies that I consider more sisters than friends…and it all started because of this little thing called a food blog. Today, after I celebrate birthday breakfast with Mel and Jordan, I’ll head to the airport to pick up two of the people who make my life as happy as it is. They’re leaving their families for the weekend to come and celebrate me on my day. Tonight, 2 more arrive, and they’re bringing their families. And tomorrow, yet another blogger will arrive and we’ll finish off our weekend with a big party Saturday night where my worlds (mom and blogger) will collide. None of this would be possible without this blog. My life would not be what it is today without Crazy for Crust. For that, I owe her a bigger Happy Birthday than I even deserve. In all honesty, I’ve been looking forward to my 40th birthday since before I turned 30. My husband turned 40 the year we got married so I feel like I’ve always been playing catch up to him. I have friends who are worried or dreading their 40s, much like many were dreading turning 30 a decade ago. The only reason I’m not looking forward to 40 is twofold: sagging skin and metabolism. The rest? Is so much better than even 5 years ago. My 20s were a time of stress and angst and love and happiness, all rolled into 10 years like a crazy ball of yarn. College, dating, teaching, meeting Mel, moving away from home, marriage, baby troubles, moving across state lines, having a baby. My 30s were full of love and happiness and motherhood, but they were also full of anxiety and depression, money troubles, and stress. I feel like 40 will be like a re-birth for me, albeit with skin spots and wrinkles. But you know what? I’ll take every single wrinkle and pound that the last 10 years has brought me. They’re like war wounds; each one with a story. And I wouldn’t change a one of them…even though sometimes I want to. Because each wrinkle makes up who I am today, at 40. I’m a loving wife and mother, I’m a successful business owner. I provide for my family, love my job, and am stronger than I ever have been…all thanks to most of the people who will be at my party this weekend. 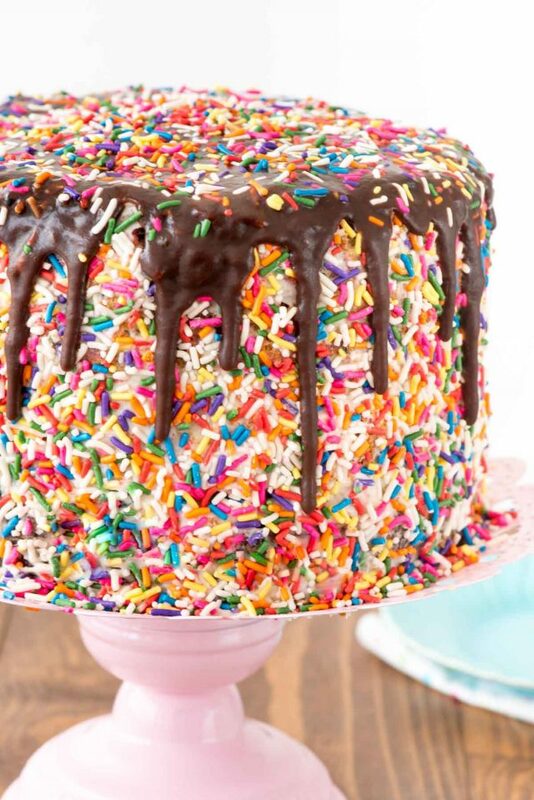 This cake isn’t actually what I’m serving at my party but it is my dream birthday cake: three layers of brownie and funfetti cake filled with cream cheese frosting and topped with chocolate and sprinkles. 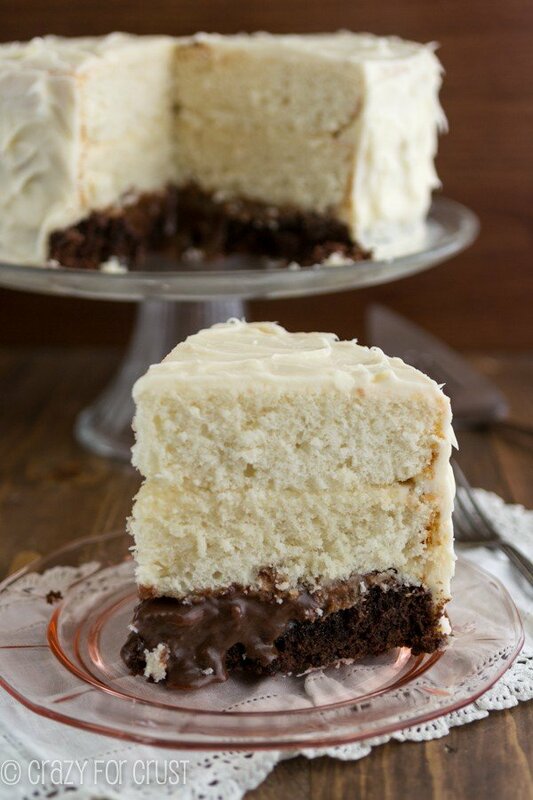 The other name for this cake is heaven. And it was super easy to make because it starts with a mix. Believe me, I’m no cake decorator. If I can do it, you can do it. Layer one on this cake is a fudgy brownie. I used a box mix but this homemade brownie recipe works as well. The other two layers are yellow cake mix I filled with sprinkles, but feel free to make my yellow cake from scratch and fill it with sprinkles. The most important thing to remember when you’re using a mix is that no one will notice if you make your own frosting, so I filled the cake with my favorite cream cheese frosting. The outside is full of sprinkles and the top is drizzled with an easy chocolate sauce and more sprinkles. Sprinkles for the win on this cake! This recipe is easy and fast and can be made by anyone, even if you’re not a cake maker. It’s the perfect birthday cake! Be sure to use good quality sprinkles. I prefer Cake Mate “Jimmies” brand for baking inside the cake. They don’t melt like some of the cheaper ones do. 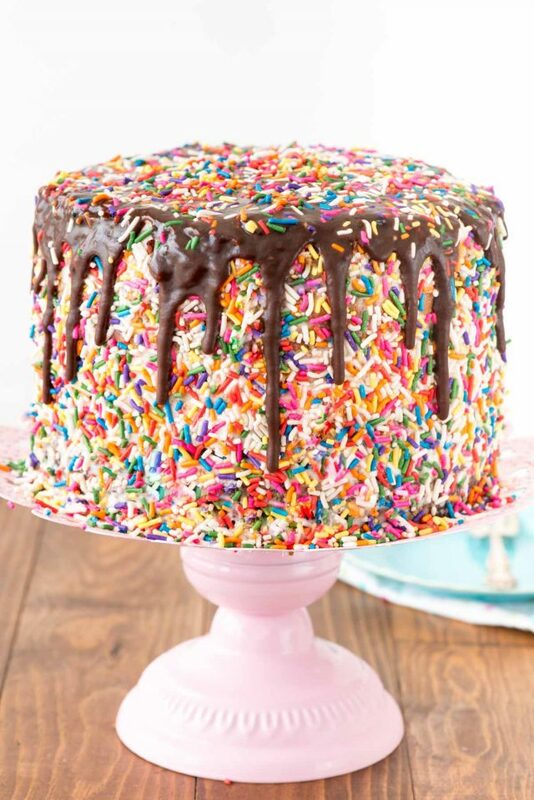 Nonpareils will melt inside the cake, but are fine for the outside. I used 8″ round pans but you can use 9″ if that’s all you have. Level the cakes as needed before stacking. Chill in between layers for easy decorating. And, one more thing before I go: all of you who have made this blogging adventure what it is: thank you from the bottom of my heart. I couldn’t have done it without you! 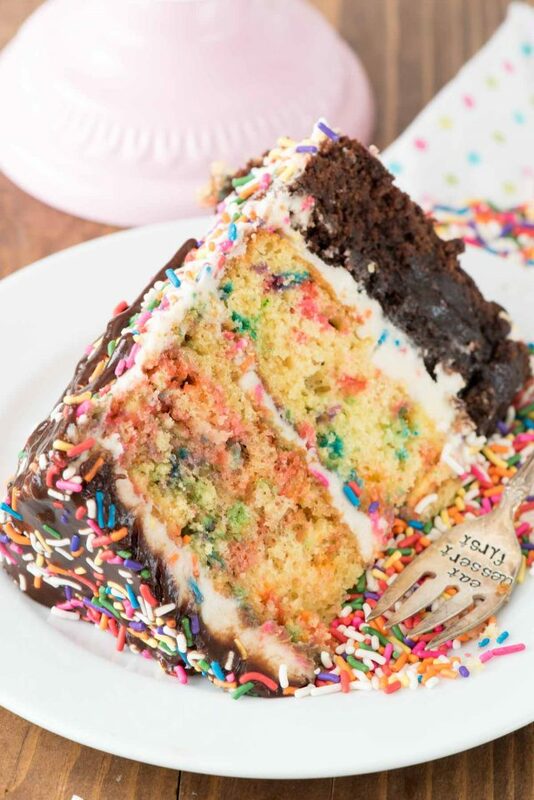 Funfetti Brownie Layer Cake - this cake is easier than it looks! There's a layer of brownie and two layers of confetti cake, filled with a cream cheese frosting and topped with a hot fudge chocolate drizzle! It's the PERFECT birthday cake recipe. Make the brownie mix according to package directions. Pour into prepared cake pan (the one with foil) and bake for about 40-50 minutes until a toothpick comes out clean 2” from the edge. Cool, then remove from the pan. Mix the cake mix with milk, oil, and eggs until smooth and no lumps remain. Stir in sprinkles. Pour equally into two remaining pans and bake according to package directions, or until a toothpick comes out clean. Cool completely before removing from pans. Make the frosting by beating the cream cheese and butter until smooth, then slowly mixing in the powdered sugar. Mix in vanilla and beat until smooth, then stir in sprinkles. Divide the frosting into three parts. Place the brownie layer on the bottom of a cake plate. Top with 1/3 of the frosting. Add one cake layer and another 1/3 of the frosting. Top with remaining cake layer. Frost the top of the cake with some of the remaining frosting and give the sides a light coating with the remaining frosting. This is also called a “crumb coat”. You’ll still see the cake through the sides but that doesn’t matter because you’re coating it with sprinkles. To coat the sides with sprinkles, take handfuls and press them onto the sides of the cake. This is a messy step! Chill the cake until ready to finish it. Make the chocolate drizzle: place chocolate chips, butter, corn syrup, and water in a small pan. Heat over medium low heat, stirring constantly, until melted and smooth. Remove from the hot pan and let cool at least 10 minutes, stirring a few times. Finish the cake by coating the top with the chocolate and drizzling it down the sides. Top with more sprinkles. Chill to set. 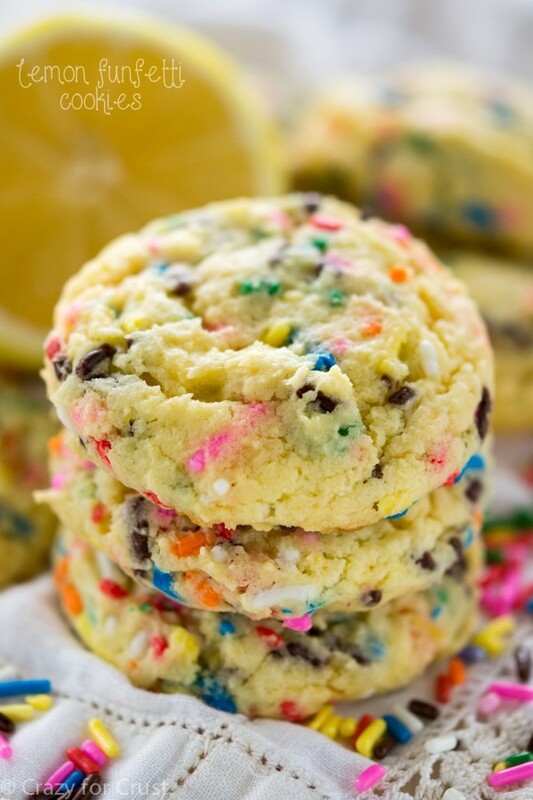 Be sure to check out all my funfetti cake batter recipes and these too: Funfetti Cookie Cake by Wine & Glue, Softbatch Funfetti Sugar Cookies by Averie Cooks, Birthday Cake Caramel Corn by Lemon Tree Dwelling, or Funfetti Donuts by Spend with Pennies. Happy Birthday, Dorothy. Enjoy your special day!! So happy you are joyful and embracing the aging process! What else can we do??? I have already passed 40, 50 and 60! Yipes!! Inching toward 7-0! Live each day and treasure the little things! I hope you had an amazing weekend. I love your blog. You are an inspiration to me. Can you please post more European types of sweets too pls? I just finished making this cake for the 2nd time in less than 2 months! It’s delish..and will feed many people…with all the layers, a very tiny slice is all you need! !